I wish I could have gotten this shot with a better camera. IQ would have been better than awkwardly waving a humble Bridge Camera around with a small sensor. However, I don't want to disturb the nest. Using Live view with a little Bridge Camera was the only way to quickly get a shot before Mama returned. Cardinals are secretive nesters and very sensitive. They will abandon their nest if they feel at all disturbed. This nest is inside our Solar Room; which is part of our home. One day while I had the door open for our dogs to go outside to go potty, two Cardinals unexpectedly flew in. Not wanting to have these birds trapped, I left the door open so that they could get out again. However, only one left at a time; while the other remained inside. Since they took turns coming & going, I didn't know what to do. So I left the door open to keep the birds from being trapped. As a result, we soon had a cardinal nest in one of my hibiscus house plants!!! And then Cardinal eggs. This morning, there was just 3 eggs. This afternoon, we now have one baby!!! Mama Cardinal does now briefly leave the Solar Room ever so often. However since we have an active song bird nest, I have to leave the door open for her to come & go at will. Daddy Cardinal only comes in occasionally. Mama now seems to be taking care of most everything. And she gets very, very upset every time, we go out into the Solar Room (which I must do to put the dogs outside to go potty). Luckily, the door is about 40 feet away from her nest. So if I stay at that distance, she tolerates it & has stayed with her nest. I don't want to do anything to upset the new family. 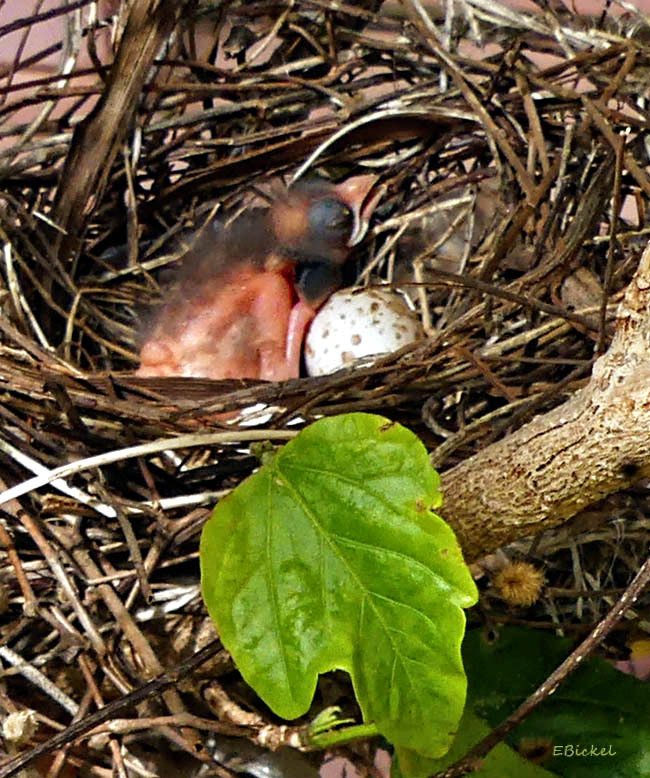 I did some reading about baby cardinals, and mama will immediately remove all droppings before they soil the nest or nearby areas. Mama also goes outside the house when she does what she has to do. So there are no bird droppings inside my Solar Room. But we do have an active Cardinal Nest "in" our house!! !